As a part-time expat, I spend my winters in Mexico. And, while I have a home on the central Pacific coast, there’s another part of this vast, varied country that I’m drawn back to visit year after year, thanks to its affordability, beauty, cleanliness, people, and great vibe. It’s the town of Puerto Escondido in the state of Oaxaca. Oaxaca is a remarkable area of southern Mexico…and Puerto Escondido is its crowning jewel. Its friendly people and rich history make for a great place to visit…and to consider for a transplant into a life of leisure and comfortable coastal living. Whether for retirement, or a home base for portable income opportunists, Puerto Escondido has much to offer. With new roads and short flight times from larger airports, this area has grown to a population of over 45,000 in the last few decades. This medium-size tourist town is just a few hours’ drive southeast from Acapulco. Strolling the palm-lined malecón (boardwalk) at Zicatela beach on Puerto Escondido’s east side is a magical experience. This is home to world-class surfing that draws competitors from across the globe. 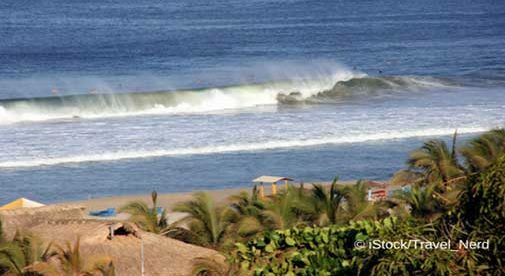 Many come for Puerto Escondido’s famous Mexi-Pipe wave and world championship competitions. As a non-surfer, just watching the 10- to 15-foot breakers crash the shoreline is an exhilarating experience. Gift shops, fantastic food, and an abundance of music venues line the sandy shores of Zicatela, which is the longest beach in the town. I found it be one of the cleanest and best-kept shorelines on Mexico’s southern pacific coast. Other beaches in the area include Playa Carrizalillo, Playas Angelito, Manzanillo beach, and Bacocho. This is also a popular scene for coffee and chocolate. Their history here dates back over a century. Along with tourism, they continue to be economic drivers for the area. Puerto Escondido International Airport is just over an hour’s flight from Mexico City, yet a drive or bus ride from Mexico’s capital through the mountains entails a winding 11-hour journey. From the airstrip, it’s just a 10- to 15-minute commute to the town center and beaches. The area is quite popular with expats as well as surfers. Void of big developments and large all-inclusive hotel chains, Escondido has a strong appeal for those seeking a little less hustle & bustle. The Benito-Juarez market offers affordable and un-crowded shopping for fresh fruits, veggies, nuts, spices, seeds, and beans. There is also a superstore with good deals on toiletries and other household goods. If you’re on an exploratory excursion to Puerto Escondido, you can expect expenses to start at around $1,500-$2,000 a month for two people. Of course, that can vary with lifestyle and time of year, but this would reflect a starting figure at a good time seasonally. December through February is in the prime-time range (I tend to visit in the spring). This cost includes pretty much everything from accommodations (rented apartment), food (eating out and shopping the markets, plus filtered water), entertainment (sightseeing, whale watching, fishing, scuba, snorkeling, surfing, baby turtle releasing…), WiFi (not the fastest but it’s there), and transportation (primarily taxi if you don’t have a car). Real Estate prices for a decent property with an ocean view and comfortable living space start at about $145,000, but for those with the resources…the sky’s the limit. Whether it’s a vacation, extended stay, or exploring medium size towns in southern Mexico…. Puerto Escondido is definitely a short-list destination.